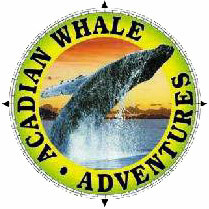 Acadian Whale Adventures is located next to The Harborside Hotel & Marina in downtown Bar Harbor, Maine. They offer 3 distinct whale watching trips aboard Proteus a brand new high-tech luxury catamaran. Acadian Whale Adventures is your best opportunity to experience the thrill of seeing humpback, finback, minke whales, dolphins, porpoises, seals, eagles, puffins and more. For your comfort Proteus offers heated cabins with cushion seats, a full galley with bar and a state-of-the-art computer controlled motion stabilizing system. With Acadian Whale Adventures you can expect extensive rail-space for front row views of the action. Underwater cameras & microphones which broadcast on plasma televisions throughout the cabins, give you a special glimpse into ocean life, while a professional naturalist provides an educational and entertaining narrative into your adventure. Visit their website for more information, rates and online ticket sales. (Bar Harbor) Bar Harbor Whale Watch Co.